Spinach, croutons, and Parmesan cheese create the filling for this baked shrimp-topped fish fillets recipe. Thaw fish, if frozen; rinse and pat dry with paper towels. Set aside. For stuffing, thaw spinach; drain well, pressing out excess liquid. In a medium mixing bowl combine spinach, egg, croutons, Parmesan, sour cream, water chestnuts, and onion powder. Place 2 fillets lengthwise in a 13 x 9 x 2-inch baking dish. Spoon one-fourth of the stuffing over each fillet in the dish. Fold fillets over stuffing. Repeat with remaining fillets and stuffing. 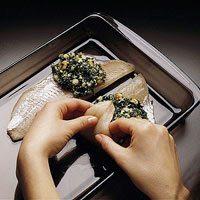 Bake, covered in a 350 degree F oven for 30 to 35 minutes or until fish flakes easily with a fork. Meanwhile, cook shrimp, if desired. In a 1-quart saucepan bring 1-1/2 cups lightly salted water to boiling. Add shrimp; return to boiling. Reduce heat' simmer, uncovered, for 1 to 2 minutes or until shrimp turn pink. Drain. Cool slightly, then peel, leaving tail intact. Keep warm. Prepare Quick Hollandaise Sauce. Transfer fish to a serving platter. Spoon some sauce over fish. Place 1 shrimp atop each fillet; garnish with dill, if desired. Pass remaining sauce. Makes 4 servings. Place 3 egg yolks in a blender container. Cover and blend about 5 seconds or until mixed. In a small saucepan heat 1/2 cup butter or margarine, 1/2 teaspoon finely shredded lemon peel, 4 teaspoons lemon juice, and a dash white pepper until butter is melted and almost boiling. With blender running at high speed and lid ajar, slowly pour in butter mixture. Blend about 30 seconds or until thick and fluffy. Serve immediately. (To reheat, place sauce in a small saucepan over very low heat. Heat, stirring constantly, until warm. If sauce is too thick, stir in 1 teaspoon to 1 tablespoon water.) Makes 2/3 cup. Calories 525, Total Fat 36 g, Saturated Fat 19 g, Monounsaturated Fat 11 g, Polyunsaturated Fat 2 g, Cholesterol 332 mg, Sodium 669 mg, Carbohydrate 20 g, Total Sugar 1 g, Fiber 3 g, Protein 32 g. Daily Values: Vitamin A 0%, Vitamin C 42%, Calcium 32%, Iron 19%. This entry was posted on 2:51 PM and is filed under Fish and Seafood . You can follow any responses to this entry through the RSS 2.0 feed. You can leave a response, or trackback from your own site.